Mom lives a couple of miles away from The Place where my family resides. My sister lives within five miles of mom's apartment. Mom is 87 and she thinks she doesn't need to listen to neither my sister's nor my suggestions as to the best ways to maintain proper self-care, healthy hygiene habits, and adequate upkeep of home. Basically, encouraging healthy lifestyle habits. As far as mom's concerned, she knows best. But, her idea of best often results in problems... for all of us. So what my sister and I have set up (leaving tons of room for tweaking) is double-teaming on all things involving mom. Sis takes care of doctor stuff, and provides assistance with the far-too-often ER trips mom creates for herself. I manage her medication for several chronic illnesses and conditions. I'm also in charge of grocery shopping to make sure mom has foods that best suit type 2 diabetes needs. Today was grocery shopping day for mom. When I went over to her place last Sunday, in addition to sorting her meds for the week, I also took inventory of her fridge, pantry and miscellaneous household items - laundry, dish, detergents; body soaps, lotions and shampoos, and over-the-counter stuff. This is why: My sister and I determined that the reason for the many ER visits was that Mom was buying all the wrong foods and eating out a lot - a routine she and her previous home aide thought was perfectly okay. So, I studied food plans to help manage diabetes, high cholesterol and blood pressure. 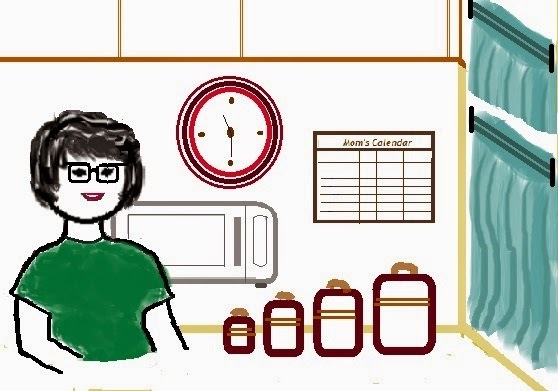 I went so far as to prep daily meals for mom so that she could get an idea of what meals and snacks should look like and at what intervals she should be consuming them. We thought she had a handle on managing her meds, but soon found out that there was no order or routine as to how to space them out throughout the day, and more importantly, take them as prescribed by her doctors. Continued ER visits clued us in to this problem. So, with close supervision, meds schedule was finally designed so that they worked to produce optimal results in treating her illnesses. Mom's home-aide cleans the apartment, launder's mom's clothes, and takes her out for exercise and fresh air. Mom is supposed to only have shower while aide is there with her. Mom doesn't listen. She sometimes decides to shower at 2:00 am - when she can't sleep. This is an especially huge no-no. So, instructions are that she shower when someone is there. Even though ER visits became fewer and further apart, December and January had us scrambling to figure out what was cause of frequent UTIs and yeast infections. We determined, with ER doctor, that maybe poor hygiene habits was the culprit, as well as, use of strong, heavily scented soaps and inadequate rinsing. The last instructional lessons that we gave mom were on the importance of using milder personal hygiene cleansing products and lotions, and house cleaning products. I took all non-approved items from cabinets and shower enclosure and replaced everything with milder products. But mom's difficult and, like I said before, thinks she knows what is best for her. One of those things is the insistence that chlorine bleach must be readily available for kitchen sanitizing and proper washing of undergarments... which are not thoroughly rinsed when hand washed. What mom does is pour way too much bleach in the sink to just sit there, fumes filling her small, unventilated apartment; if she calls saying she's feeling dizzy, first thing we ask is if she's been using bleach or heavy duty cleaning products. After last ER visit, during which nothing was diagnosed for dizziness, nausea, chills and severe itching, which mom was complaining about, sis and I discovered that mom had bought antihistamine which we found in a drawer a few days after hospital trip. She never mentioned that she had been taking the pills. Another doozy of a find, was the large, near empty bottle of rubbing alcohol that she was dousing herself with to treat "fevers." What in fact was happening was that OTC allergy pills were interacting with prescription meds and alcohol was causing skin irritation and dryness, not to mention effects of fumes and large amounts being absorbed into her skin which were causing mystery symptoms. After nearly two years, it seems like we have finally figured out what to look for whenever we get a late night call from mom saying she doesn't feel well and needs to go to the hospital. The last time she called us, we waited things out, administered doctor recommended dosage of extra-strength Tylenol and let her make the call when it was okay for us to leave because she started feeling so much better. Her Nurse Practitioner assured us that we did the right thing; it was the height of flu season, and the last place we needed to go was the ER. Better late that never, it was a relief to finally make it out to do her shopping today. I haven't been feeling 100% for the past few weeks, so I had to muster the strength to shop; we needed stuff for work and school lunches too. It still took me those 2 1/2 hours, but mom has more than enough healthy food stuffs to get her through the month. She seemed extremely grateful and pleased with this gesture. Our goal is simple: Keep mom healthy and happy.